I’ve been hearing there is some magic “waste” within road funding that, once it’s found, will solve the road funding problem in Michigan. It just didn’t seem right. We need nearly $1 billion to address the short and long term issues associated with transportation funding in MI. 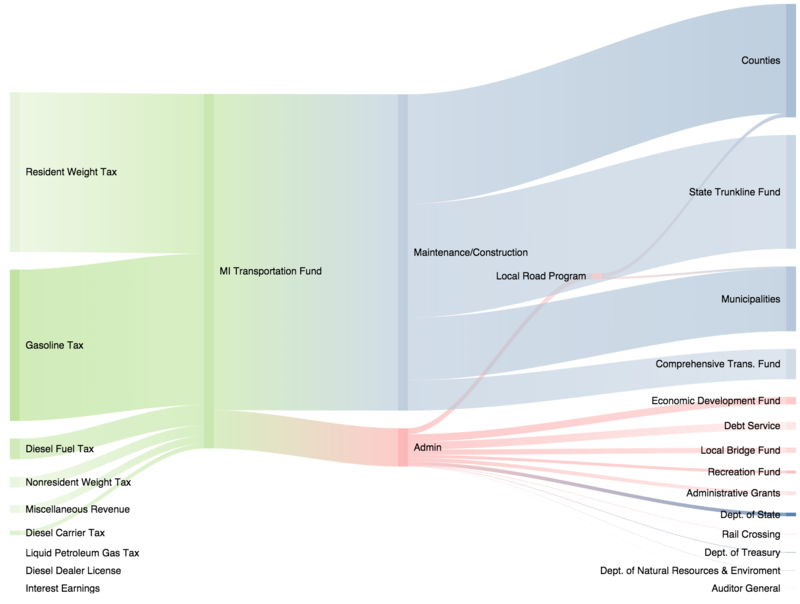 So, I set out looking for a way to graphically represent how the road taxes are collected and distributed. It turns out, MDOT puts all of its MTF distribution reports in one handy place online, so I didn’t have to look far. The following “Sankey” chart shows how funds in 2014 were collected (Left) programmed (middle) and then finally distributed (right). Hover over each to see the raw data. Every single penny of transportation funds that are collected go to the Michigan Transportation Fund, totaling slightly more than $2 Billion. Things can’t run themselves. We need planners and accountants to ensure the money gets spent correctly. That’s the admin part (in red). Two governors, Labor Leaders, the MI Chamber, the Michigan Municipal League, the MI Association of Counties and countless other organizations have said we need between $750 million and $1.5 billion to bring our roads, bridges and transportation services into the 21st century. The “admin” section is actually sort of a misnomer. About 1/2 of that portion is actually part of grant programs that are programmed from the state level, but for some reason the MDOT spreadsheet includes them in the Admin/Grants section and I’m not here to question that. State Trunkline funds go to – you guessed it – state trunkline construction, repair and maintenance. That includes all of the “M-” roads like M-1 (Woodward) and M-22. Cities and Counties receive funds to program on local road projects. Counties or county road commissions act on behalf of townships to program those funds. Depending on what part of the state you live in, there is probably a Metropolitan Planning Organization (MPO) there to help plan and administer those funds. Examples include SEMCOG or the Grand Valley Metro Council. The Comprehensive Transportation Fund provides capital and operating funds for transit services for persons with disabilities, county dial-a-ride services and urban public transit in Michigan’s core urban areas. It’s how they buy the buses and it makes up between 20% and 50% of local operations for local transit service. Now, SOME transportation-related things are paid for outside of the MTF. Things like trails and greenways – those are funded by revenue from the Natural Resources Trust Fund. We’re talking puny pennies, though. Not the magical “billions” wasted on highfalutin bureaucrats throwing khaki-and-badge-only parties in the MDOT break room. Looking at this chart – do you see any wasted billions we can shift around?